The Michigan Student Assembly (MSA), the student government at the University of Michigan, Ann Arbor, soundly defeated a proposal last week that would have created a committee to examine university investments in companies that do business with Israel. The 25-11 vote against divestment was heralded as a huge success for the pro-Israel community on campus. "This is all about the students – they rose to the occasion," said University of Michigan Hillel Assistant Director Rabbi Jason Miller. "They are so proud of themselves, and we couldn't be prouder of them." "It was really nice to see that student activism exists on campus and people really care," said Perry Teicher, a member of both University of Michigan Hillel's governing board and the MSA. "It was incredible how many Jewish and non-Jewish supporters came to the meeting." The MSA meeting on Tuesday, March 15 had already been moved to a larger room due to an estimated high attendance, according to Miller, but when it quickly became apparent that the crowd far exceeded the room's 150-person capacity, the meeting was moved to a ballroom where, ironically, a [former] white supremacist had spoken earlier in the evening [at an event sponsored by Hillel's Conference on the Holocaust]. Speakers both for and against the resolution voiced their opinions during the meeting, which lasted into the early hours of Wednesday morning. The resolution attacked the Israeli military's practices toward the Palestinians as "reprehensible" and "unjustifiable" in 14 paragraphs leading up to its conclusion, which "put the verdict before the trial," according to MSA President Jason Mironov. "That's not how we do things in the MSA, and that's not how we do things in America," Mironov said. Even with a motion to strike 11 of the 14 clauses from the resolution, which would have eliminated any direct condemnation of Israel, the measure still failed. Hillel student leaders credit the large contingent of Jewish students – including Jewish members of the Greek system, birthright israel participants and activists in the campus pro-Israel group American Movement for Israel – who attended the meeting to demonstrate their opposition to the resolution for ensuring the victory. "These people, who largely wouldn't show up to a Jewish event even if you paid them, showed up in blue and white. 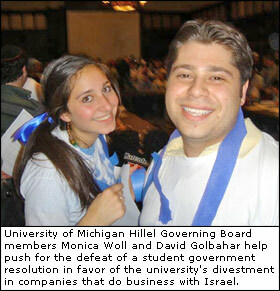 It was incredible," said Monica Woll, chair of University of Michigan Hillel's governing board. "Members of the Jewish community should be commended for their articulate speech and their respect for the issue and the people involved," added Mironov, who made the unusual move of coming out against the resolution before the vote. A Tuesday morning article in the Michigan Daily, the campus student newspaper, that predicted the resolution had a "reasonable" chance of passing also boosted attendance at the meeting, Miller said. "It was a thinly veiled attempt at vilifying Israel, and it's especially sensitive to me, as it attacked my own people and a country I believe has a very strong right to exist," said Mironov, who is also active in Hillel and chair of its Half-Shekel Campaign. Though excited about the vote's outcome, Jewish student leaders know their work is far from over. Dialogue with those who supported the resolution is an essential part of creating a welcoming environment for all students on campus, Woll said. "There needs to be a system of education and a place where groups can talk and see where the other side is coming from," Woll added. Both Mironov and Teicher said they felt comfortable with their dual leadership roles in Hillel and the MSA. "Being president of MSA is my responsibility. Representing the Jewish community is my duty," Mironov said. "I was elected partially because of my commitment to the campus community and partially because of my beliefs."